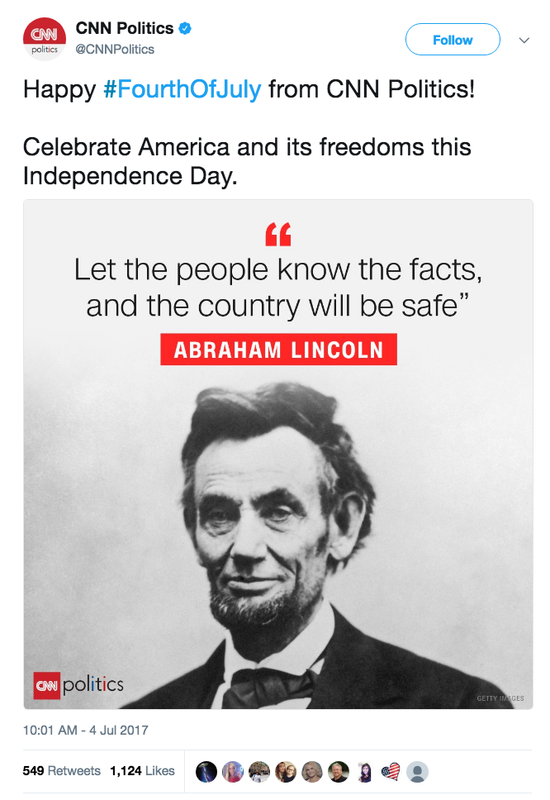 Surely CNN could Tweet a simple 4th of July greeting without deceit, right? Look at the Tweet above. The quote is attributed to Abraham Lincoln. The intent was to slap the current President in the face with the implication that he makes the country unsafe with less than factual rhetoric. There is a difference between ‘facts’ and ‘truth.’ Facts can be manipulated, a skill at which CNN exceeds. CNN has no interest in the truth based on the way they excel at disseminating fake news. The inaccurate meme above is a microcosm of a much larger integrity issue with the struggling network. How can an entire political party condone this? You can’t fix stupid. CNN is beyond repair.